Red herrings are one thing. But this murder mystery seems filled with partially fileted fish of all kinds in the hands of a chef who can’t decide on a recipe. 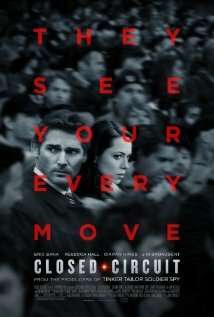 This is a dark and suspenseful movie, but its thrills are too quickly diffused. There are too many loose ends and unfulfilled promises. Too many ideas are introduced and not fully explored. There is too much style, not enough imaginative substance. When one character asks if it’s possible to “get out with honor,” she could be speaking for the filmmaker. The movie is weakened by the fact that the question is never answered; it’s one of many unanswered questions in the film. The best actors are given too little to do. But the big problem is that the leads, Bana and Hall, are not actors of subtlety and nuance; the best they can do is look thoughtful and pensive — and they do. A lot. They lack the chemistry — and their roles lack the writing — to deliver performances that would provide the central core of humanity this story needs. This movie is “about” so many things; we need it ultimately to be about two people we care for. And it never quite becomes that.